Australia has the most unappealing retail sector in the developed world. Wow. A new report published by BCG, and reported in the SMH today, shows that Australians are the developed world’s most frequent online shoppers at international retailers. Take the ‘fashion accessories’ vertical for example… a staggering 38% of Australians make the majority of their purchases at international online stores. 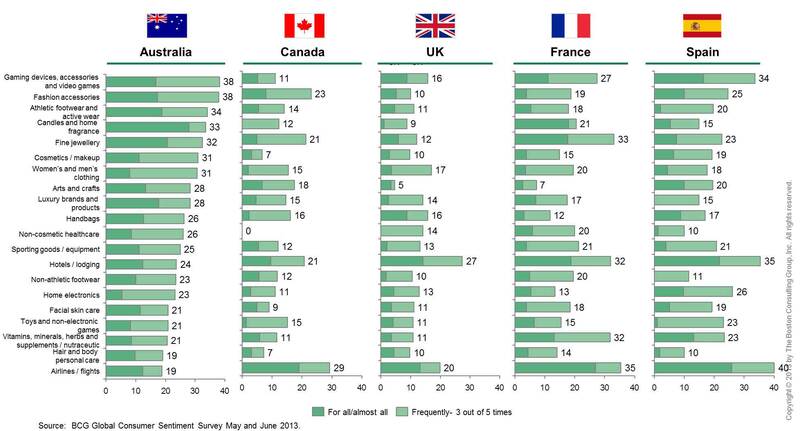 This compares to 23% in Canada and 10% in the UK. Total online purchases by Australians in the year to May-2013 were $13.7 billion, up 18% on the prior year. Sales of physical retailers were up just 3.2%. It’s always fascinating to read the debate in the user comments underneath online news articles. But at time of publication every single user comment under the SMH article is essentially a vent about the crap state of Australian retail. Consumers are pissed at the sector. Comments highlight the failings of Australian retail as: 1) price rip off; 2) underwhelming quality and quantity of shop assistants; 3) poor quality product; 4) crap range. While the data is a pure indictment on the state of Australian retail, the good news is that there is plenty of upside potential for our brands and shops if they can get passionate about what they do and can reconnect with the consumer.